This chapter is an examination of the influences involved in the integrating of adults into higher education. The chapter begins with an exploration of the increase in the number of adults in higher education since 1969. Comparing the changes in demographics from 1969 to 2007 shows how little large public universities have done to integrate adults into higher education. This examination shows significant participation by three types of institutions; community colleges, small private four year liberal arts institutions, and for-profit institutions created to meet the higher education needs of adults. The chapter defines adult and higher education and discusses how they differ or interact. 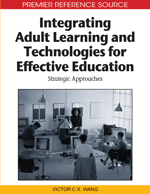 A discussion of how adult students learn and effective techniques to facilitate learning in adult classrooms follows these definitions. Finally, a discussion identifying how teaching techniques that are effective for adults can be integrated into traditional classrooms in higher education brings the chapter to a close.